Blaring radio commercials, endless internet ads, and the panicked social media posts of friends are here to remind us that it’s tax season. Retirement doesn’t end the obligation to pay taxes, even if your loved one no longer earns an income from work. If a senior in your life struggles with home management, dementia, or tasks of daily living, they might need help preparing and filing their taxes. Here are answers to the most common questions about tax season. Federal income taxes are due on April 15 every year. If April 15 falls on a holiday, taxes are due on the next business day. For example, in 2018, the April 15 was a holiday, and taxes were due on April 18. People who are self-employed must file quarterly taxes on January 15, April 15, July 15, and October 15. They must also file income taxes and pay any remaining balance on the fifteenth of every year. Corporate taxes are due on September 15. So if your loved one owns a business — even a small one, such as an Etsy or eBay shop — they may have to file a tax return September 15. Each of these deadlines follows the same rule: if the deadline falls on a holiday, taxes are due on the next business day, which is usually a Monday. The IRS offers an automatic extension for most taxpayers. This extends the deadline for six months with a single form. So if you don’t have time to do your loved one’s taxes or need to consult an expert, consider filing for an extension. You can even submit a payment with the extension to reduce the risk that you will have to pay interest for filing late. When Should You Start Filing? The IRS begins accepting tax returns in late January. If you find taxes stressful or your loved one is eligible for a tax refund, filing early may offer relief. If your loved one’s taxes are complex, it’s also important to begin the process early, in case you run into an issue or need to find a form. Who Should File Your Taxes? If your loved one needs help filing their taxes, they should designate you, an accountant, or someone else as the third-party designee. The IRS offers a simple form for doing this. Completing this form allows the IRS to talk to a third party about another person’s taxes. Without this form, the IRS can’t talk to you — even if your loved one has dementia or another condition that makes it impossible for them to communicate with the IRS. If your loved one’s taxes are simple, you can usually file them yourself, or with the assistance of tax software such as Turbotax. Self-employed seniors, those with businesses, those who owe tax debt, and anyone else with a complicated tax issue should instead seek the help of an accountant. The IRS offers helpful tips for finding and hiring a tax professional. 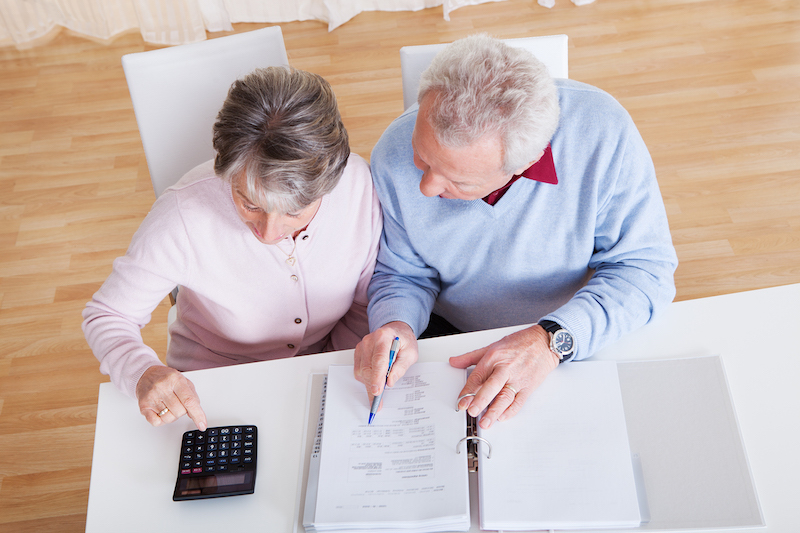 What Do Seniors Need to Know About Taxes? The standard deduction for seniors is higher. Seniors with businesses, many charitable donations, or very large healthcare expenses, however, may save more by itemizing their expenses. Seniors over 65 and those who are disabled are eligible for a tax credit. State income taxes can affect the amount you ultimately owe. Click here to learn about income taxes in your state. Social Security benefits are taxable income. The IRS offers a comprehensive guide and worksheet on this topic here. You must pay taxes on income earned through self-employment, even if the business is a small hobbyist business. Any income in excess of $400 through self-employment is taxable. Taxes can feel overwhelming and frustrating, especially if your loved one ends up owing money. Senior living can remove one of the challenges of caregiving, and may even help your loved one save money on living expenses. This can make your tax burden more bearable. To learn more about talking to your loved one about senior living, view our free guide.